Before we start typing any code, let’s explain what the above video demostrates. In this post, we’re going to create some Flight Stop Actors which have two spline components and two assigned float curves. 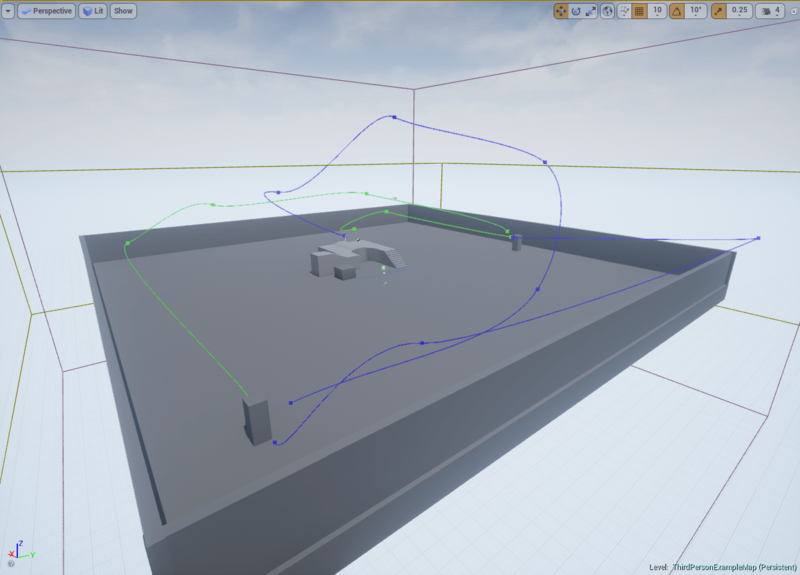 The spline components describe the actual flight path that the character will follow when he selects either of them. As a convention in this post, one spline component corresponds to the next flight path while the other spline component corresponds to the previous flight path. The assigned float curves describe the way that the character will travel the selected flight path (meaning the total travel time and therefore his travel speed). The character contains a box component in order to identify any nearby flight stop actors. Moreover, I’ve provided two inputs in order to select the next or the previous flight path (if available). In order to start implementiong the above mechanic, create a new C++ Third Person Template Project that comes in with UE4. In this post I’m using UE 4.13.1 so in case you’re using a different engine version you may need to edit the code a bit in order to match your API. Save and compile your code. Then, create a Blueprint based on the above C++ class and assign a default static mesh. When you’re done with that, place some Flight Stop Actors in your level and extend their spline components. In my case, I’ve assigned a green color to the Previous Flight Paths and a blue-ish color to the Next Flight Paths. Spline Components come with just two points inside the editor. In order to add more, select a point in your spline and click the “Alt” button while you’re moving the point. This way, you can create as many points you like. Let’s move on to the character’s implementation. //The ResetActiveFlightStopActor executes when the timeline finishes. In case you’re interested more in what’s going on inside the UpdateFlightTimeline function, make sure to check out my tutorial on how to consume timelines using C++ here. //Get the new location based on the provided values from the timeline. //The reason we're multiplying Value with SplineLength is because all our designed curves in the UE4 editor have a time range of 0 - X. //Where X is the total flight time. Save and compile your code. Then, make sure to provide timelines in each FlightStopActor. These timelines need to have an initial value of 0 and a target value of 1. The time value equals the total flight time so you can temper with that value to match your needs. Update: Since a lot people ask me about the whole project, you can download it from here. Can you post an example project with this code in use? I’m struggling to get my head around it a little bit. I’ve sent you an e-mail with the displayed project. Thank you, I’ve sent you an e-mail with the project. Thank you so much for your awesome tutorial. Could you send me your project. Thanks in advance. I’ve updated the post with a download link for the project.